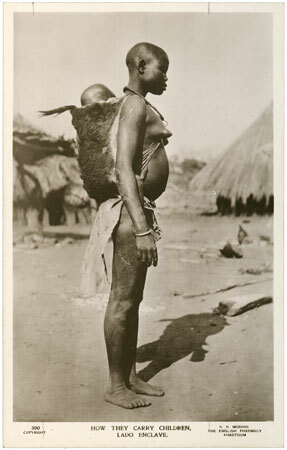 A full length profile postcard portrait of a Bari mother with a goatskin baby carrier on her back with a baby inside. Notes on postcard - "390 Copyright. G.N. Morhig, The English Pharmacy, Khartoum. How they carry children, Lado Enclave." Morton, Chris. "Bari mother and baby" Southern Sudan Project (in development). 03 Jan. 2006. Pitt Rivers Museum. <http://southernsudan.prm.ox.ac.uk/details/1998.88.45/>.